These instructions show how to prepare a vunerable Linux virtual machine with a scoring system for use in gamified learning. I got this from a CyberPatriots workshop at a WASC Faculty Development Week in June, 2017. We tried Ubuntu 14.04 but were unable to get the scoring engine to update automatically. Ubuntu 16.04, Desktop version, works. I don't know what other Linux versions might also work. These instructions show you how to score one vulnerability: firewall off. The same procedure can be used for any other vulnerabilities you wish. The firewall is inactive, as shown below. The command sudo ufw status returns the message Status: active, as shown below. We'll need that information later. Execute this command to disable the firewall again. We need the Java jdk version 8. Enter your password when you are prompted to. A message appears saying "you should continue to use Java 8". Press Enter to install the repository. You should see version 1.8, as shown below. The last step is to set Java environment variables. The screen freezes for a few minutes. That's normal. After a few minutes messages should start to scroll by, ending with "15 gems installed", as shown below. 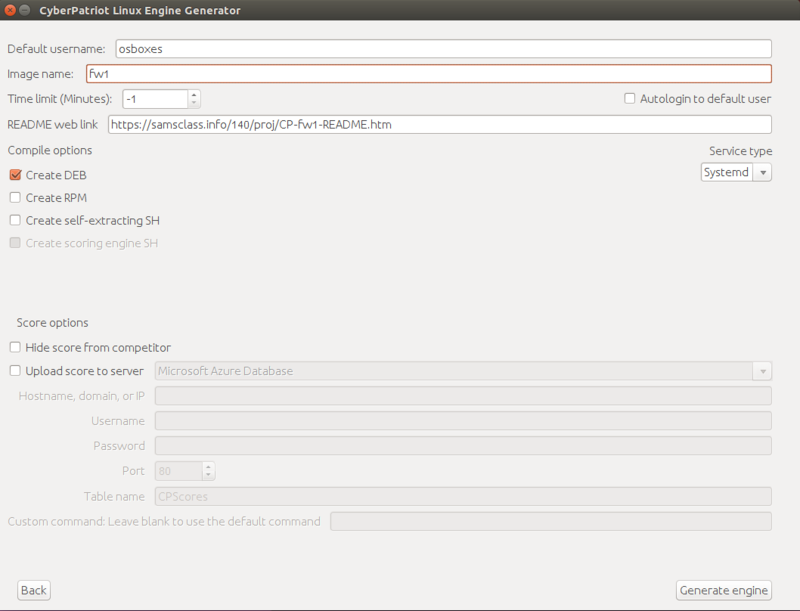 The CyberPatriot Linux Engine Generator launches, as shown below. Accept the terms of service and click Next. There are four options, as shown below. On the next screen, enter these values, as shown below. Then click the "Save and create a new Command-based vulnerability" button. 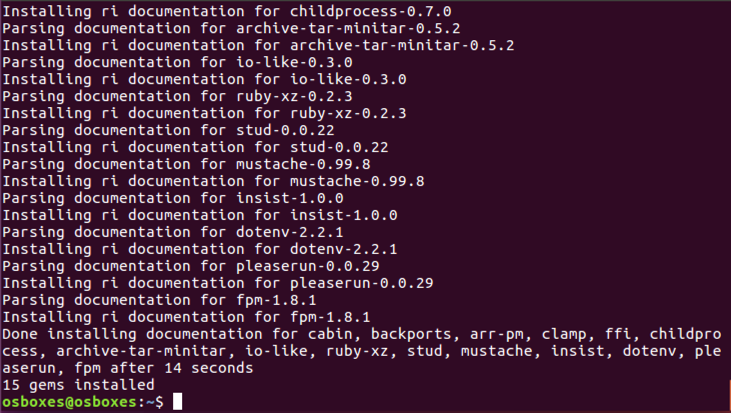 Note: the command will always run as root, so don't include sudo. A box appears saying "Vulnerabiity confirmed successfully!" Click OK.
At the lower left, click the "Main Menu" button. Click "Review Vulnerabilities and Finalize". A list appear, containing only one item, as shown below. In the next screen, enter these two items, as shown below. At the lower right, click the "Generate engine" button. A box pops up saying "Generated successfully! Check the executable location for the files." 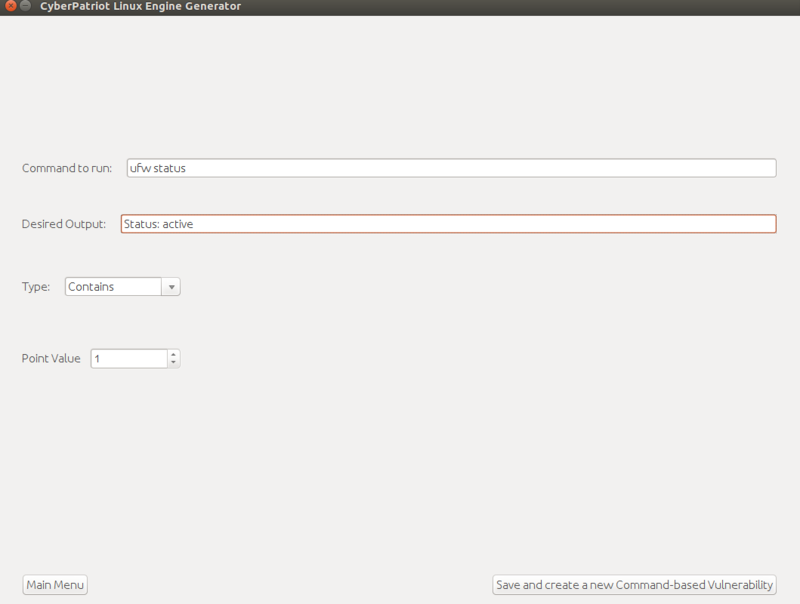 Close the "CyberPatriot Linux Engine Generator" window. A file has appeared named fw1_1.0_all.deb, as shown below. This is a Debian package containing the generated scoring engine software. The software installs, as shown below. Reboot your Linux machine, and log in with the same account you used previously. 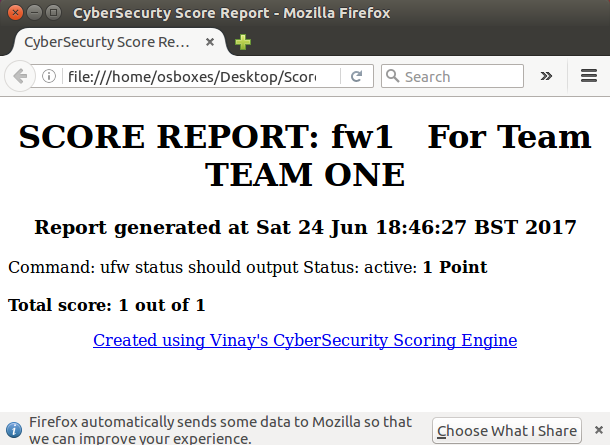 There are now three icons on the desktop as shown below: ScoreReport.html, Readme, and "Set Teamname". Double-click the "Set Teamname" icon first to set your team name. Then double-click the Readme link to see the README page. 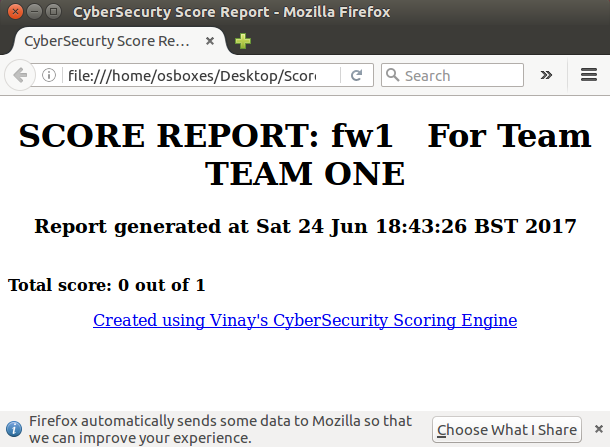 Finally, double-click the ScoreReport.html to see your score. You have 0 points, as shown below. Refresh the Firefox page every few seconds. Within 30 seconds, you should see your score increase, as shown below. Refresh the Firefox page every few seconds. Within 30 seconds, your score should go back down to zero. You obviously want to add more vulnerabilities. Before you can install a revised scoring engine, you must uninstall the current one. To create a new scoring engine, return to the "Installing the Scoring Engine" section above.